Jackson, John J.. "Jack Purcell". The Canadian Encyclopedia, 04 March 2015, Historica Canada. https://www.thecanadianencyclopedia.ca/en/article/jack-purcell. Accessed 18 April 2019. Jack Purcell, badminton player (b at Guelph 24 Dec 1903; d at Toronto, Ont 10 June 1991). Jack Purcell, badminton player (b at Guelph 24 Dec 1903; d at Toronto, Ont 10 June 1991). He was famous as a lanky, lithe athlete with a wide repertoire of badminton strokes and tremendous court presence. In the 1920s he won numerous Ontario titles and was Canadian singles champion in 1929 and 1930 before turning professional in 1932. Professional play was of the barnstorming, challenge variety. In 1935 Purcell helped design a cutting-edge badminton shoe, which in subsequent decades became popular casual footwear. 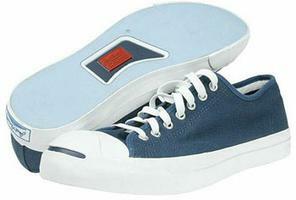 Converse purchased the rights to the "Jack Purcell" shoe in 1972, and "Jack Purcells" are currently produced and marketed by the company as a comfortable, all-purpose shoe. After defeating top professionals from Canada, England and the United States, he was acclaimed in 1933 the professional champion of the world, retaining his title until retirement in the early 1940s. Following his sports career, Purcell enjoyed a success career as a stock broker at the Toronto Stock Exchange. Canadian sportswriters chose Purcell in 1950 as one of the outstanding Canadian athletes of the half century. He was inducted into Canada's Sports Hall of Fame in 1955, and although he never played in Olympic competition he was nonetheless inducted into the Canadian Olympic Hall of Fame in 1973.